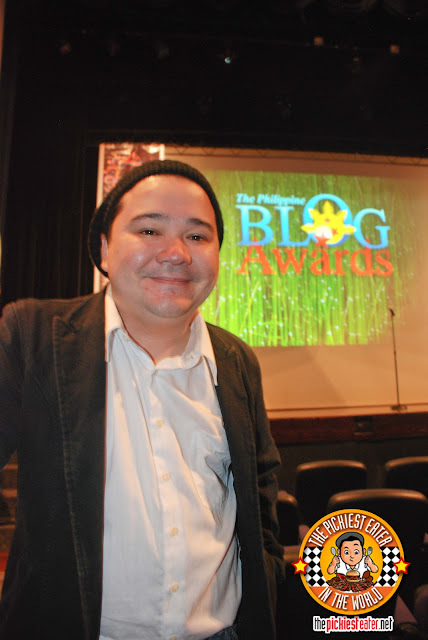 Last July 4, I got an email from "The Philippine Blog Awards", telling me that my blog was nominated for one of the "Major Categories" (I went out on a limb and suspected it had something to do with food). I was a little taken aback because, The Pickiest Eater In The World had only been barely a year in existence and to get recognized by a body as prestigious sounding as "The Philippine Blog Awards" was a big deal. Imagine, one or maybe more of my readers liked my blog so much that he/she took time off from their day to point the panel of judges to my blog, because they deemed it among the best in the country today. Of course the feeling was exhilarating. Then I find out that it was my wife that nominated me. Apparently a friend of hers told her about the awards, and suggested that she place my name into the hat, seeing what would happen. After confirming the nomination via email, that was pretty much it. Months went by, and I didn't hear a peep from them. Then recently I saw a list of blogs that made it to the best blogs of Nuffnang or something like that. 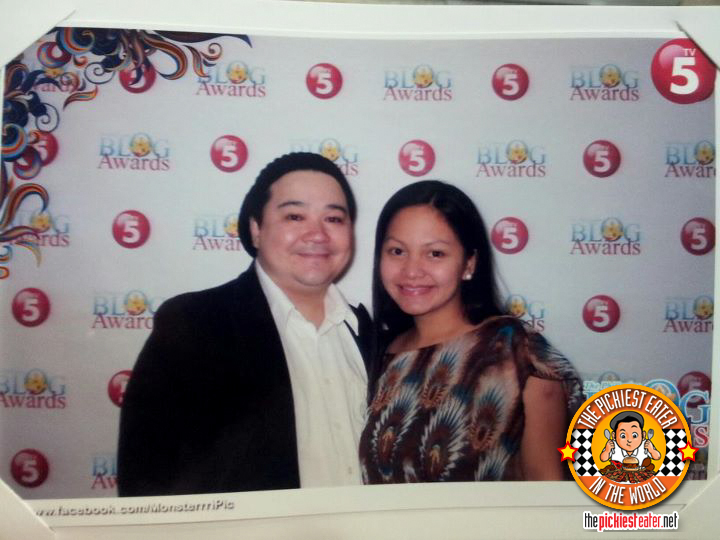 For some reason I assumed that it was the same thing as the Philippine Blog Awards. When I double checked the Philippine Blog Awards site, it said that the awards night was December 3, and since it was mid-November, I thought my humble blog didn't live up to the standards of the Blog awards. I thought to myself, maybe I'll just try again next year. Then on December 2, the day before the Philippine Blog Awards Night, I get an email congratulating me for being a finalist in the Food & Beverage category on the National level. So I called up Rina to tell her the good news, and that we needed to go to the awards night the next day. And all she could say was..
"What am I gonna wear!?" I've been in the blogging game for a little over a year, so to be a finalist on a nationwide level really meant the world to me, but nevertheless, I told Rina that I wasn't going to the awards night without her.. because she's a part of this blog as much as I am. So she decided that she was going to allow the Yaya to take care of Baby Rain for the few hours we'd be gone (She takes the term "hands on mom" to a new level). 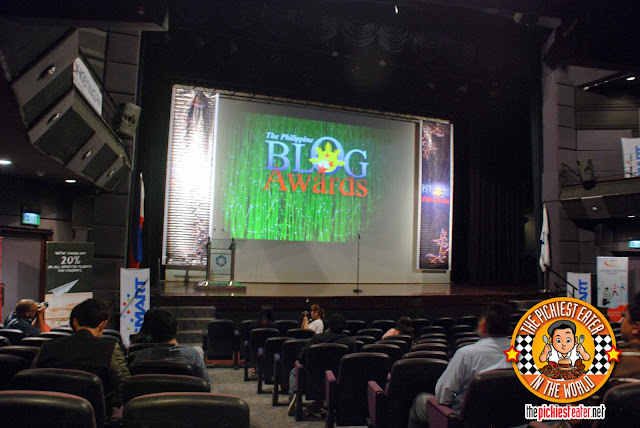 The Philippine Blog Awards is a great thing for bloggers such as myself. It's nice to be recognized for our work because it's very personal to us. With all the time and effort (and money) Rina and I have invested in The Pickiest Eater, its a wonderful feeling to know that someone has been paying attention. It was a small, intimate gathering, that actually had a good turnout, considering that the invitations were sent out just a couple of days before. What I enjoyed about this awards night was the anonymity. I'm up for an award, but no one knows who I am, because it's my BLOG that's in the spotlight.. not me. Just how I wanted it to be. As the awards night began, the host (I forgot her name) gave out an interesting little tidbit that gave me a warm and fuzzy feeling inside. For some reason, (and to be honest, I don't know what I was thinking) I was under the impression that I became a finalist based on the strength of Rina's nomination. Perhaps when tallied, only us 14 food blogs were nominated. But then the Host explained, there were countless blogs that were "nominated", but only a select few made it through as finalists. It turns out, for the past couple of months, the panel of judges had been screening my blog, and viewing my posts. Then, blogs are whittled down, based on their criteria for judging (whatever it may be). 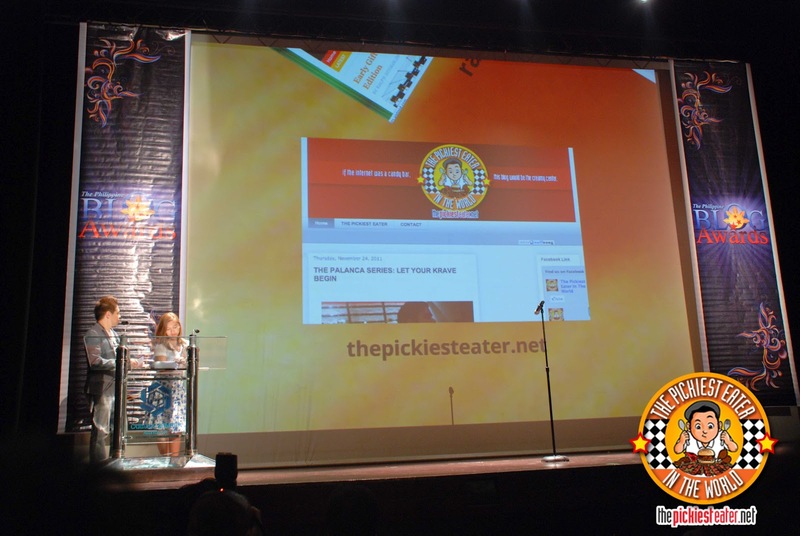 If I remember what she was saying correctly, The Pickiest Eater In The World blog survived Three waves of judging, before reaching the final round, which culminated at the awards night. And I didn't even know it. How awesome is that? This picture still gives me goosebumps every time I see it. Not many of you know this, but last September, before Rina gave birth, I was very close to shutting down my blog. I didn't know how I'd be able to make it work, being a first time father and all. So I thought about it and decided that, maybe I need to slow it down a bit because having a daughter is going to take time and money.. something my blog does too. But the blog is something in which my daughter can be a part of some day too. Seeing my blog there during the motion graphic montage of the nominees was surreal. Words cannot describe how proud I was to see my blog header up on the big screen. Almost like my blog was my own son, and I was the daddy, just beaming with pride. It made me think how glad I was that I decided to stick around. We didn't win the award, but... I really needed this. I needed to know that The Pickiest Eater In The World Blog can stand toe to toe with the best food blogs in the country. To be honest, I never really knew where I stood. Am considered an amateur? Because if you think about it, Im still using a blogger template. The pros usually design their own. I have no knowledge of Web/html/java/or whatever. I don't want my blog to be mistaken for a food directory.. There's a more comprehensive one over at www.myfoodtrip.com. I also have no intention of cluttering up my page with phone numbers, addresses, google maps or anything like that. Oh, and the most I can do in Photoshop is "crop" pictures. Not to mention, I'm totally clueless with a camera. And I'm supposed to be a food blogger, but I'm THE PICKIEST EATER IN THE WORLD. There are so many things I don't or can't eat. This blog was basically just borne from me watching an episode of Man v Food for the first time, then suddenly realizing that if I collated all my facebook albums of food, I'd have enough material for a food blog. If you think about it, there's no reason for this blog to succeed. Yet here I am, one year and five months later, a finalist in the Philippine Blog awards. As of this writing, the Pickiest Eater Facebook page has grown to 790 "Likes" on the sheer strength of word of mouth. And if this online percentage calculator is right, my readership has increased a staggering 781.81% from exactly one year ago, today. Which is uncanny considering last year, I was posting three times a week, and this year, I only post once a week. I remember going to Rina, bursting with pride, and saying, "Wow, Ten people viewed my blog all of yesterday! ", and though they were probably all relatives or officemates I coerced into going to my site to up the stats, she'd always reply with a loving kiss on the cheek and saying "I'm so proud of you". Considering all my shortcomings as a blogger, I tried to think of what exactly this blog has been about that seems to be working. So I thought about it, and I finally figured it out. I remembered my fellow blogger, Dreaming of Dinner, posted something on her facebook profile awhile back (quoting another blogger I think) saying something so very simple..
"Blogging Should Be About Love". And I guess that's everything my blog is about. It's not just about food. It's about the LOVE of food. Why else would I spend all this money on effort on a blog that doesn't earn a single cent for me? 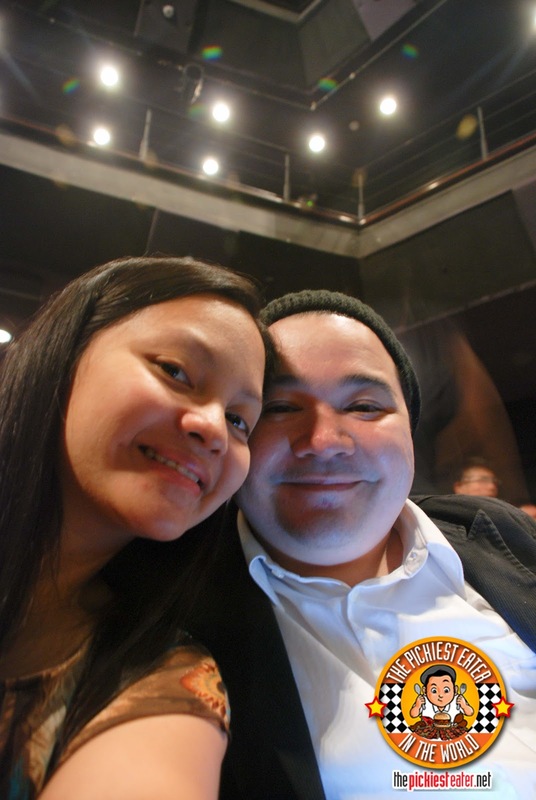 Whether it's about me declaring my love for my wife, introducing the world to my daughter, showing off my beloved dog, dining out with friends or spending time with my family, this blog is, and will always be about love. Thank you to everyone that has stuck around for the past year. Please do share my posts that you enjoy with your friends, and get them to like my page on facebook as well. This page would not be possible without the support of my wife Rina, her sister Chaikka, her Boyfriend Don, and my sisters Raquel & Rose, their husbands Julio and Randy, as well as my brother Ryan and my cousins/fellow food adventurers Paolo and Patty, and my loved ones in the U.S., my ever so supportive Ninang Pochay, my niece Cara and cousin Mary Anne. A special mention to my friends, such as My Giant Joel and the TallGrrl Joanne for the future plans *wink wink*.. Mark for being my go-to guy when it comes to artwork.. Ted and Karen for helping Rina and I out for any camera problems.. Paik and Jona for the caricatures, my dear friends Rain, Melvyn and Osh for rarely letting a day go by without saying the words "Let's eat at _____ one time" to me.. Direk Joaquin Valdes for the continued encouragement and support.. My regular blog commenters, Clare, Roxy, MichyMichyMoo, Midge, Meedge, Pink Cookies, The Purple Doll, En Route, Edelweiza as well as Leslie and Michael of MyFoodTrip.com, and Zai, Maybelle and Ariel of Weemall.com..
And most of all, thank you to YOU.Yes You, the person who is reading this right now. Whoever you are, from whatever part of the globe you may be from, I hope I've found a way to make you laugh and make you hungry at the same time. If you haven't yet, pls "Like" me on Facebook.. and Follow me on Twitter .. I agree, your blog is full of love and that's why it's worth the read (and yeah, you could use some help in the html department -- your pics go out of the post body template kasi, i've been meaning to tell you about that, hehe!). Don't ever quit! I'll miss this blog if you do! Thank you Sumi! Hope you don't et sick of dropping by! Thank you Madz! I hate to go all "Bring It On", but coming in second or whatever still feels like first :) Im so glad you drop by my blog! I visit Pig Out Sessions too! I know Meedge, That's why I couldn't make a thank you post without mentioning you :) Thank you for the support! thanks for the mention! i really love reading your blog. you are one of my inspirations to start mine. when you told me that you are thinking of not continuing this i was really bummed. i remember telling you, "what am i going to read? please don't stop blogging." and then months later, a nomination to the blog awards. wow! i am really proud of you and rina. congratulations! and next time bring home the bacon! Congrats! Having been a finalist is an honor on its own! And yes, I can feel your love for food in every food post you make. In fact, that's what makes me click your other articles thru the LinkWithin plugin. Good food blogs like yours inspires me to be better in blogging about food, too. Haha Zai! Yes, my blog is here to stay.. I don't think I could find it in myself to NOT be a food blogger.. Im in the game already and I'm hooked! Thanks so much for your enthusiasm.. it never fails to make my day :) Hope to meet you soon! man i find your blog very interesting, neat & simple. keep it that way! you have the blog "it" factor. as they say"when you have it, you have it!" i just like the way you tell your story(i think in the ranks of marketman). it's clear & crisp like watching HD, hehe. there's not so many bloggers as young as you are who can write that well! and i'm just a lurker voicing an opinion. Congratulations bro! So proud of you! Kuya PeeMo, Thanks for the support! Im still waiting for our next Ramen Trip! I know this is an old post but I just read it now. It perfectly exemplifies why I enjoy reading your blog. For me, it isn't about what you eat or don't eat, or how polished your blog looks. It's about how likable you are, and you Richie, are one of the most likable bloggers that I've come across. Not only do your write well, but you express yourself with a sincerity, a humility, a candor and gratitude that is very refreshing. Wala kang yabang at all, and I think in the end, that's what draws people to you. Plus you're really funny. Thank you so much, JB! That really means a lot, especially coming from a fellow blogger.. whose website just blew my mind. Your layout and photos are excellent! I'm looking forward to going through your site! !